Here at Adelaida Springs Ranch we raise natural grass-fed beef cattle and sheep to provide you with a healthy, delicious alternative to industrial, corn-fed meats. We love our cattle and sheep, as well as the landscape that feeds them. 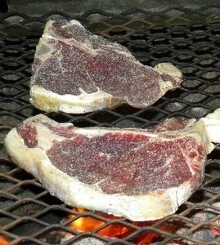 Of course, we also love the taste of the tender, succulent, healthy meat they produce. Our beautiful Angus cattle and Dorper sheep are bred naturally here and graze freely on the ranch for their entire lives. We believe our approach is better for the animals, better for the environment and makes tastier food that's better for you. To learn more about our ranch and growing techniques, read our pastures and practices article. Although our meat is seasonally available in local shops, including J&R Natural Meats in Paso Robles and Nature's Touch in Templeton, most of our meat is sold directly to our customers. By selling directly, we can offer you a better price and related benefits, such as discounts on wine, events and other ranch products. All of our meat is USDA inspected, dry aged, frozen fresh and vacuum packed in plastic by J&R Natural Meats in Paso Robles. Pick-up your meat locally at J&R Meats in Paso Robles or make arrangements to pick up your meat at our tasting room. 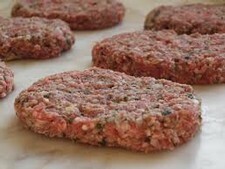 Our ground beef will be back in stock in June. Get started with healthier grass-fed beef. A perfect introduction or gift package. Currently out of stock until June. 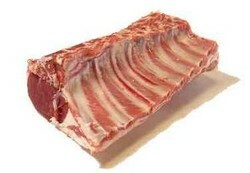 Order your delicious selection of grass-fed lamb now. 10 lb. box of 1 lb. vacuum sealed, frozen packages. 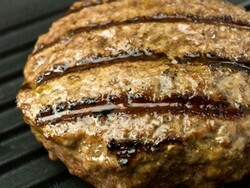 Order your delicious selection of grass-fed beef now. Currently out of stock. Please join Beef Club now to get a box from June 2019 harvest.